Judging by all the comments I've received about the Samsung Tocco Lite, it's a very popular phone. No wonder Samsung is trying to recapture that winning formula with the Samsung S3650 Genio, it's also known as the Samsung Corby outside the UK. Undoubtedly, Samsung is gearing the Samsung Genio for the younger market segement with its colorful back covers. The Samsung Genio is a bit smaller in length than the Samsung Tocco Lite though the former is also a tad wider and thicker than the latter. The Samsung Genio only has 2.8 inches of screen, which is resistive. On the front we have the menu and the call and end buttons, on the left side you have the volume controls and Samsung's proprietary connection which you can use to charge your phone or connect it with your computer. On the right side is the screen lock button and the camera button. The memory card slot is found at the back when you remove the battery cover. Thankfully, Samsung didn't put it behind the battery so you won't have to remove your battery in order for you to access your memory card. There's not much I can say about the Samsung Genio's design except that it reminds me of the first generation HTC Touch phones. The Samsung Genio is reasonably palm friendly and pocketable. 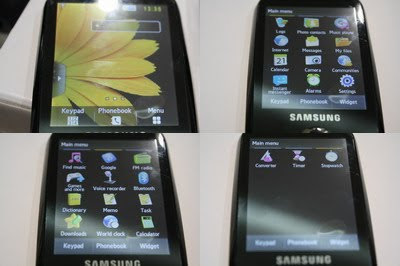 The Samsung Genio has 2.8 inches of screen which is capable of displaying 16 million colors. The phone vibrates with each gesture you make and it also has an accelerometer which allows you to rotate the screen. The screen reminds me of my Samsung Omnia because colors are a bit washed out and suffers a lot when viewed under direct sunglight. The User Interface uses Samsung's TouchWiz UI which means you'll get widgets galore and kinetic scrolling. I don't know whether this is a software issue since this is a fairly early model but responsiveness is not up to par with the Tocco Lite although its still very much responsive compared with the first generation Samsung Omnias. 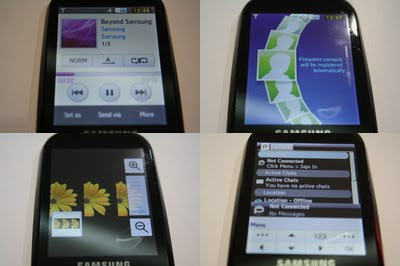 The UI is very similar to the Samsung Tocco Ultra. You can change fonts and even zoom in on the contents using the volume rocker. The only thing new on the Samsung Genio's UI is that like all new TouchWiz phones, it has three homescreens which you can fill up with widgets. 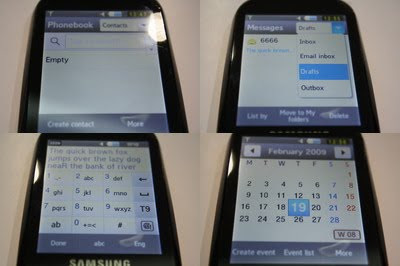 The Samsung S3650 Corby is disappointing when it comes to messaging. First of all, you'd think they would have put in a QWERTY keyboard but no, you're stuck with the alphanumeric keypad. The good thing is that even though this phone is youth-centered, your grandparents can use without having trouble seeing the fonts since the size is adjustable. The Samsung Genio is capable of MMS although there's no separate option for that. The message only turns to MMS once you've inserted pictures, videos, voice tags, etc. The calendar is pretty useful for a budget phone. You can set up appointments with reminders and even set up recurring events. There's also a Memo application, tasks, and World Time. On the widgets screen there's a birthday reminder, and two widgets which can help you remind you of your diet or if you want to quit smoking. The Samsung Genio has a built in FM radio with RDS, RSS reader, YouTube App, Picsel Viewer and a NetFront Browser. The Picsel viewer really comes in handy when viewing documents such as MS word, Excel, PDF, and PowerPoint files. There's also a messenger application which is actually Palringo, my favorite IM application. I've always liked Samsung's built in music player. Unlike the Touch Player on my Samsung Omnia, the Samsung Genio can support WMA files directly as well as MP3s, AAC, eAAC, eAAC+. Audio through the speakers is poor and doesn't really play music loud enough. Wasn't able to see how the Samsung Genio handles videos but don't expect it to play DivX files outright. There's no onboard 3.5 mm headset jack but like the Samsung Omnia, there's a 3.5mm headset jack on the Samsung proprietary connector. I don't know how Samsung will price the Genio but if the price it higher than the Tocco Lite, then people are just probably going to ignore this phone and go for the one that has the best bang for their buck, in which case, that's the Samsung Tocco Lite. However, if Samsung pegs the price of the Genio lower, then teeners will probably opt for this one considering that it's more stylish than the Tocco Lite. Since carriers will probably offer the Samsung Genio for free, users would just have to factor in what do they want more: a cameraphone or a stylish phone, in deciding whether to get the Tocco Lite or the Genio. Any idea when will this be available in the UK? I haven't seen it in Samsung's website. When will this be available in the UK? What contract wil it be on? Hi when will this phone be out in the shops and wat shop will it be in and will it be on pay as you go??? I don't know the exact date, just that it's around October and yes, it will be available on pay as you go. When will this be available in the uk? I really need a new phone and i really want this one (:. Also how much will it be? Vodafone has a 10% discount online deal for £53 pounds now. Only in pink or white though. Hi just wondered if you could tell me how many alarms th phone has? i got this phone today and as far as i can c its ok for the money the tuch screen is a bit sensitive but overall i would recomend it,i like the smart unlock feature check it out. will it be out on meoteor? dont buy 1 they are faulty !!!! i bought 1 and they useless !!! i have a problem i dont no wether to get the phone because i do not no that if i get it i will not be able to text with it because i am used to the new text if you see what i mean because i do not want to buy a contract if i cant use thee texting can oyu adapt to the old way easily ? Availabe now on Orange in the UK for £69 with the £10 top up so basically its £80. But you can get the extra top ups like unlimited texts and other packages. My 3 contract is up soon so this may be my next phone. ''...Tocco Lite supports smile shot while the Genio doesn't so undoubtedly...'' that is not true, you can find smile shot option in camera settings. im so glad its cheap because it looks awesome!! have been bought this phone for xmas.have had a good play with it before it has to go back in its box.im 43 this is my first touchphone and have found it great.easy to use found texting easy and all aplications work well love having facebook and msn to hand.would recomend at a good price £73.00 from vodaphone shop inc £10.00 top up. Its cheap and pretty, and also im not keen on touch screens so i wanted to know if its good or not. I have this phone. The games are the only dissapointing thing seeing as it only comes with demos, no full games...apart from that it's pretty good. i'm 16 and i really like the media player. texting is easy, and the facebook/twitter/myspace apps are useful. i live in the uk too...but yeah...overall it's a decent phone. My parents just bought me one of these for christmas, I never really asked for it, it just happened to be only £79 so that's why they bought me it. It arrived today, took me a little while to mess around with it and it never came with any usb cable to connect it with my pc unlike my last mobile phone, luckily I have a card read... and it didn't even come with a ds card, luckilly I can easily enough get my hands on one. It's a stilish little phone, good job I don't really care what mobiles can do these days and I'll be asking Santa for a digital camera aswell though. But other than that, it's funky and fun to use, I'll just have to wait till christmas to be able to jazz it up the way I want it. its a shame you cannot connect you're phone. i recently brought the Genio. You have to buy the apps. and it dosent come cheap. The Genio was £80 on vodafone. But i brought mine in asda For £75. but all together the phone is good for teenagers. i am getting the samsung genio for christmas and i just can not wait but i have some questions is there a facebook and msn widget ?? hmm, i really want this phone. but i dont know wheather to, as the camera is only 2.0 mega pixels. i think this phone looks gorgeous although.. i dont just want it for its looks, any infomation? I recently purchased the samsung genio from the carphone warehouse on the T-Mobile network as it is currently priced at £66.00 compared to my regular network 02 which was priced at £107.00 (plus £10 top-up). And im glad i did... not only did i save £40 but the samsung genio is quadband... meaning i can use my O2 sim card in the phone... So why are O2 charging an extra £40 for this mobile phone ???? I got the Samsung Genio Touch yesturday, and I absoloutely love it! The touchscreen is so easy to use and I love the sleek , stylish design. GO GENIOS! every one get this phone coz its awsome. looks fit. and go 2 orange coz they give u a test run if u want!!!! Yep. If you're on PAYG, you'll have to pay to use the internet. If you got it on pay monthly, it would depend on your contract, if you have unlimited data plan, you don't have to pay. Just took sons back to vodaphone inside screen cracked they said it was physical damage but it wasnt dropped or that, they said that even pressure from being in pocket with keys could cause this. they then took the battery out to send phone away and said there was also moisture damage ,phone has not been in water or that.Need to wait to see if they will fix it . Has anyone else had any bother. Where can I get original back covers? This is a crap phone worst in the world!!!! dont get it i worn u DONT GET IT FROM 02!!! I have had this phone for 2 months now and absolutely love it! I used to have the HTC Touch HD (£500 touchscreen smart phone!) and found I didn't use a lot of the functions and it was very glitchy. Which is one of the reasons I sold the HTC and bought the Genio. The battery last AGES! Like almost 2 weeks, without charging! This has been the BEST phone I've ever had. It's easy to use - text and calling, looks good, you can change the cover, light weight. SIMPLY FAB! I LOVE IT, I LOVE IT, I LOVE IT!! However, the camera is very basic but does what it's supposed to. One Wrong Thing - The Genio Does Not Have An Accelerometer, You Have To Manually 'Tell' The Phone To Move The Screen. i got the phone about 2 months ago. It has a great battery (1 +1/2 weeks left on )and easy to use. my only problem is that i cant connect it to my computer. i used the cable from my last phone but it didnt work. I want to be able to download music from my computer. Does any one know how to do this??? you can buy this for £57 on asda's site, its vodafone pay as you go! i love this phone and thoroughly enjoy using it!!!! i dont know why people say its not a good phone, personally i think it is stylish and user-friendly! if buying for a younger person (teenager) i would suggest this! I am twelve and i thoroughly enjoy this!I hope this comment has been a help to you, and you do decide to buy this! can someone help me please, ive just bought this fone from lets just say a man with a dog. he says it needs unblocked. where do i get this done. it keeps asking for a password?!?!?!? 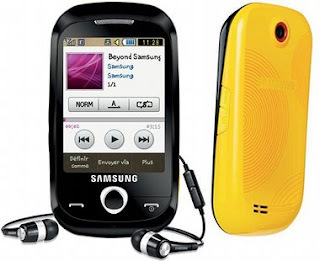 ,Hi I really want to get The Samsung Genio Touch phone but first i want to know what colour fashion jackets come and how many and is it a reliable phone for a 12 year old ??? I've had this phone for around seven months now and hadn't found any problems- until around three weeks ago. My USB cable is a different one to the one I normally use (which was from an entirely different phone) and it came with my phone. It doesn't work- at all. My phone will say I'm connected, while my computer says I'm not- but it still charges. I've dropped my phone several times- once the back flew off and the battery flew out- but the screen hadn't smashed, my phone hadn't started freezing. Now, after having it in my pocket with my keys, it has a massive scratch right down the middle. The phone is very reliable- the battery doesn't die easily. I listened to music non-stop for around twelve hours on four bars and I'd only gone down to two bars. I have just purchased a Genio Touch mobile it did take me some time to get used to. I've bought this phone, generally like it but can not work out how to upload my phonebook from my old phone via a memory card, can't do it from sim becuase changed networks - can anyone help? Have asked samsung but no response. This phone is targeting the younger generation indeed. In fact, my nine-year-old daughter is asking me for the yellow one. I do not want her to get such as sophisticated phone at her age. Hence, I gave her the Just5 phone instead. It is something very chic and is able to answer her basic phone needs. Plus, it has emergency response that allows her to ask for help in an emergency. Thanks to www.just5.com, I learned that this phone is not for seniors alone but for children, too. hey this is 1 of the best phones I've bought.the screen is awesome.I don't knw hw others get problems. its a very good phone and i bought it today and its the best phone you can get so defanatley get it. I got this phone almost a year ago when i'd just turned 12. I was missing stuff from the box including the usb wires, the manual and only came with have the backs it was supposed to. I bought it for €130 (approx) myself and I hate the damn thing. I couldn't text for the 1st month so it had to be repaired costing me €50 and If i send a text longer than 3 lines it sends the message at least twice (depending on the amount of lines). It says free text is currently unavailable and the camera doesnt't work and never has and they said I must've dropped it and it would cost me way more than the phone's worth to fix it!!!! Don't buy it.....especially in the carphone warhouse with 02!!!!!!!!!!!!!!!!! I have several problems with this blasted phone......like the above commentor said don't buy it with 02,if at all!!!! The only good thing is the battery life. I have 7 problems with this damn phone costing me twice what its worth!!!!!!!!!!!!!!!!! !